Celeste's fabulous retro card showcases my sketch perfectly! 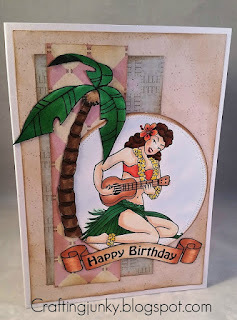 The soft muted colors in the background allow the hula girl to pop! Her coloring is amazing and this card makes me long for a vacation! Congratulations Celeste, you are my Headliner this week! ALOHA!! Congratulations to all our winners, please pick up your badges here. We hope you come back tomorrow for an fun theme challenge from Nance! So delighted to be A Cut Above! Thanks Nance, especially when you had such a great gallery to choose from. Congratulations to everyone and thanks for such an inspirational sketch to work with. Thank you so much for selecting my card as the headliner! I feel honored with so many beautiful cards that were submitted! So happy to be A Cut Above, thanks so much Hannelie. Fantastic gallery. Thanks so much for a shout out - MWAH! !